Author’s note: as I repost this for Real Context News as Trump enters the third year of his presidency, we are in midst of the longest government shutdown in U.S. history, one lasting already over a month. My below analysis is still deeply relevant, sadly: Trump began his first and now second anniversaries of taking office mired self-inflicted shutdowns. Though I originally published this article in the fall of 2013 during America’s last government shutdown, it is a sad measure of how little progress has been made that I can repost this piece today to explain relatively unchanged dynamics leading to such a debacle. We can just substitute Trump, Tom Cotton, and the Tea Party’s offspring, the Freedom Caucus, for the likes of Ted Cruz and the Tea Party and substitute the issues of DACA children migrants and immigration for the debt ceiling and budget cuts. Even if a shutdown is averted, the dynamics of partisan brinksmanship are alive and well and threaten America’s republic just as they threatened (and destroyed) the Roman Republic. By Brian E. Frydenborg (LinkedIn, Facebook, Twitter@bfry1981) January 19th, 2018; originally published October 3rd, 2013, with the title “In Government Shutdown, Ted Cruz and Tea Party Are Lucky We’re Not Living in Ancient Rome” by then-PolicyMic, now Mic. UPDATE 12:04 AM Jan 20th, 2018, the one-year anniversary of Trump’s inauguration: the government is now in a shutdown. HBO. Rome’s forum—the equivalent of Washington, DC’s national mall—dirty and largely empty, closed for business during one of its many government shutdowns before the fall of the Roman Republic’s democracy. AMMAN — As someone who’s written about ancient Roman history, I find these repeated Tea-Party-initiated shutdown and default crises amusing when, knowing that American troops might very well have their pay and benefits threatened, I think of how Roman legionaries would have reacted in similar situations and smile a bit thinking of Ted Cruz running through the streets of Washington with Roman troops in hot pursuit. Contrary to popular belief, our Founding Fathers did not base our Constitution on the British constitutional monarchy, but on the Roman Republic. 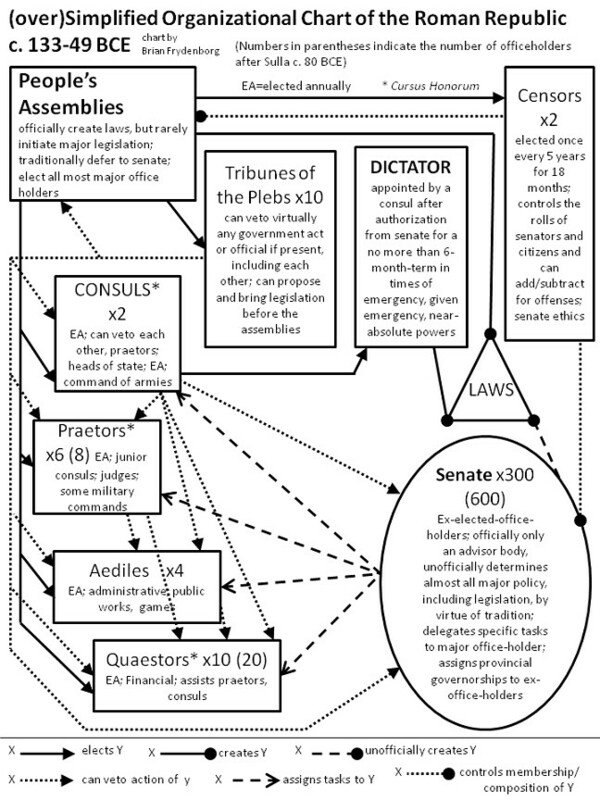 There were many historical and cultural similarities: from 509-49 BCE, the Roman republic functioned with a government based on popular sovereignty, with a deliberative legislative body called the Senate, with the people voting both for major office holders annually and yes-or-no on legislation coming from the Senate. Rome’s system was one of checks and balances, divided power, and compromise. The Republic needed its parts to cooperate, and the support of the people, to do much of anything. And because of this superior system (so argued the ancient Greek historian Polybius), Rome came to dominate the Mediterranean world with it citizen-soldiers. But with amazing success came obscene corruption and partisanship, and from 133 BCE, after the first political violence in Rome since the early days of the Republic, Rome experienced internal conflict that would eventually destroy its republic. Obstructionist (mostly) self-interested conservative elites — optimates — took on a group of (often) self-interested populist reformers — populares — for most of the next century. After decades of optimates stubbornly fighting all reform, when a conservative elitist general named Sulla and a populares former general named Marius (Caesar’s uncle!) had a major political falling out, Sulla marched his troops into the city of Rome in 88 — the first time Roman troops had ever marched on Rome — the streets flowed with blood, and there were years of civil war. Sulla later had himself appointed Rome’s first dictator since 202 (at the height of the Second Punic War), but gave those powers up a few years later after scrapping many hard-won populares‘ reforms. Roman veterans were often left to languish in poverty or limbo by the conservative optimate-dominated Senate, fueling support for a major rebellion in 62-63. Even the most famous general of the day, Pompey “Magnus,” was rebuffed when he advocated for his own veterans. Julius Caesar, himself one of the moderate populares, was elected a consul for 59 but also found only obstructionism from the optimates, led now by Cato (namesake of today’s pro-Tea-Party, libertarian Cato Institute). One of Caesar’s major pieces of legislation also aimed to settle Pompey’s veterans, but Cato, who even admitted the bill was good, filibustered and obstructed every time he could to prevent its passage. Only some mild violence meted out by Caesar’s supporters, including Pompey’s veterans, against the obstructionist optimates and Cato during the assembly that voted overwhelmingly for its approval kept the law from being blocked on a ridiculous religious technicality. An extreme member of the populares faction, Clodius, succeeded in terrorizing the city with increasing mob violence throughout the 50s, repeatedly causing major government shutdowns. Elections were long-delayed, important offices remained vacant, major scandals erupted, senior officials were attacked in public, and when Clodius was killed in 52, his supporters burned down the Senate with his funeral pyre. The Senate reluctantly authorized Pompey rarely-granted emergency powers to restore order, and soldiers were brought into the city under arms for the first time since Sulla. Yet legionaries lining courts and public areas in Rome under a sole consul was not at all the way the Republic was supposed run. Cato and the optimates still hated Caesar so much that over the next few years they made clear to him that they would never let him rest and would do everything they could to drive him to ruin, including prosecution and exile. It was easy for Caesar to convince his soldiers that the Senate did not have the interests of them or the people of Rome in mind, that a mad faction had hijacked the Roman state and needed to be swept aside. After Caesar crossed the Rubicon in January 49, a new civil war erupted in which many senators were killed, and true republican government would never return to ancient Rome. So when you say, “That couldn’t happen to America today!” realize that mass political violence, Roman armies marching on Rome, and government shutdowns had all either never happened or hadn’t in centuries, and were all unthinkable to Romans living before they actually happened; escalation begets escalation. That is what is so disturbing about the Tea Party today: its members’ willingness to do anything legal, even if unprecedented and previously unthinkable, to accomplish their goals against the will of the people sets dangerous precedents and deeply undermines the credibility of the government. And as we’ve seen with Rome, credibility that takes centuries to build can only take a generation to destroy. Learn your history, Tea Party.